There is an additional $25 applied to all memberships for NON-community league members. As long as you are a current member of any community league in the city, this fee is not applied. This year we have a volunteer deposit of $50 added to the membership fee proper above. This $50 is refunded following 2 hours of volunteering. Greenfield Tennis Club 2018 Open House is scheduled for Sunday, May 6- 1-4pm. Memberships will be available for purchase, as well as tennis class registration. SOTW (Shot of the Week) Free weekly mini-clinic with the Pro highlighting something tactical/technical. Greenfield Community League members have access to the Tennis Club courts during GCL Members' Court Time. Court Time for the 2018 season are Saturdays 3-7pm and Sundays 12-7pm (starting mid-June). For unlimited access, please purchase a Tennis Club membership. 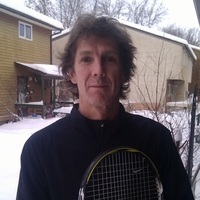 ​For the outdoor season, Coach Chris Crowley teaches at the Greenfield Tennis Club. Larger Semi-Private groups are possible too. For example, a 4-person semi-private is a terrific training environment. In the 70s and 80s Chris was a top Ontario junior; taught both adults and children; and was a scholarship player in Michigan, U.S. Chris was Track MVP in 1991 at McGill University, where he completed his MSc. in Theoretical Computer Science. Chris arrived in Edmonton in 1993 and resumed teaching (informally, and mostly with his son.) Chris returned to formal coaching in 2013, completing the Tennis Canada Instructor Course certification. Chris is currently the head coach at the Kinsmen Sport Center.